Polar bear caught your eye, eh? Our favorite part about this bear—besides the fact that he looks cute and snuggly—is the stencil-like pattern. This banner can be hung in a child’s room, living room, or on a door. 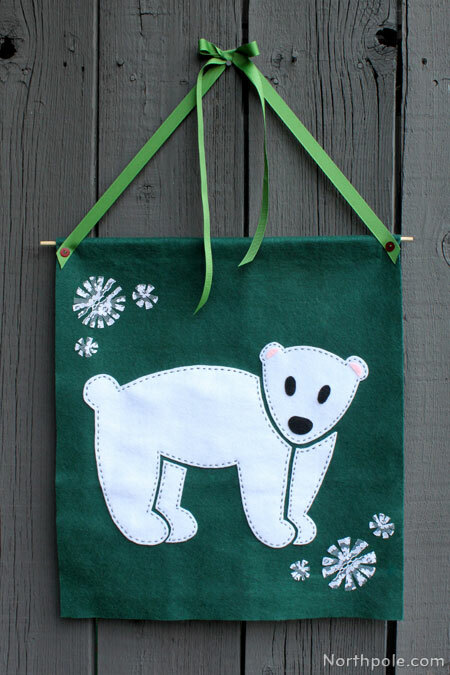 Alternatively, you can use this pattern to put the polar bear on a pillow, tote bag, or whatever else you like! Print the template, align the dotted lines, tape the pages together, and then cut out the pieces. Pin the template pieces onto felt. 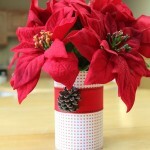 Cut out pieces, remove pins and set aside. Set template pieces aside. 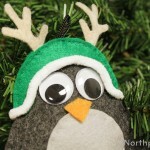 Pin the eyes and nose onto the face and sew with black embroidery floss. (We divided the strand of black floss in half.) Remove pins and set aside. Use white thread to sew the ears onto the face. Set the face aside. Measure and cut a piece of green felt that measures 18" x 20". Position the polar bear on the green felt and pin in place. We placed the bear just a tad lower than the center. If it helps, you could go ahead and fold the top edge over (as in step #12) to have a better visual. Continue sewing each piece of the polar bear. 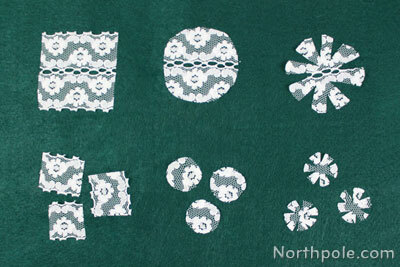 Cut snowflake shapes from the lace. We cut the ribbon into a squares, rounded the corners to make a circle, and then cut out darts. 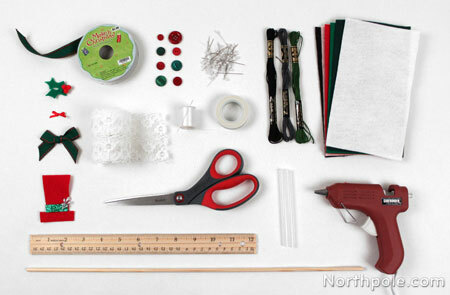 Make snowflakes in different sizes. 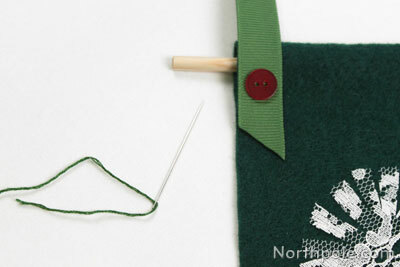 Place snowflakes on felt and sew in place with white thread (not embroidery floss—you don't want to see the stitches). Fold the top edge of the banner over (towards the back) and pin along the edge. Remove 1–2 pins, apply a thin line of hot glue, and press gently. Continue removing pins and gluing the felt until finished. 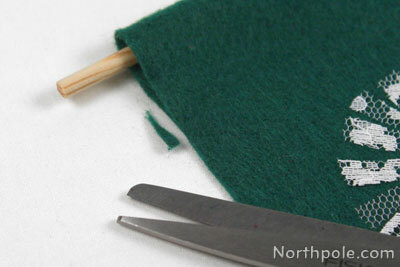 Note: To make sure you have enough room for the dowel, slide the dowel into the felt prior to gluing. Trim any excess felt, if needed. Cut 2 pieces of ribbon, each measuring 36" long. Note: Whenever we use ribbon, we like to seal the edges with a flame to prevent them from fraying. 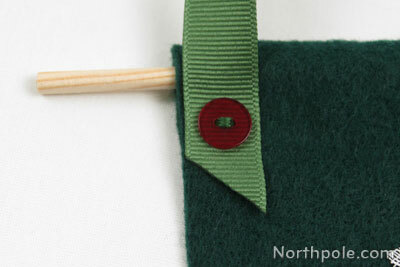 Take one piece of ribbon and position it over one end of the felt (near the dowel). Place a button on top of it. Be sure that the button is not too close to the dowel. You want there to be enough room to take the dowel in/out. 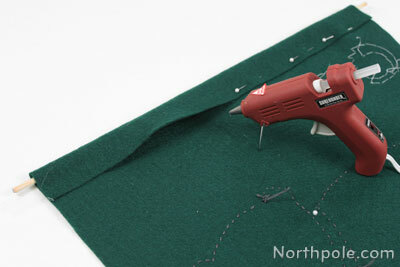 Sew the button in place, tie off ends, and trim excess. Tie ribbons in a bow and hang on your wall or door. If you like, give the bear some accessories: some holly, a hat, a bow, etc.